August 4, 2017 – Meet and Greet – Tentatively considering the OTR/REMIXX on Sycamore. 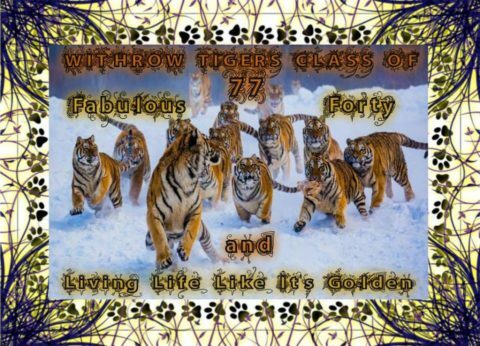 August 5, 2017 – Tour of Withrow High School & Grown Folks Cookout – Wuslin Park behind the Withrow Playground on Dana Ave.
For more details go to the Withrow’s Fabulous 40! Facebaook page. My name is Lisa Robinson Sullivan. I lived in Cincinnati most of my life and attended Withrow until mid-April of my Junior year (’76) when my family moved to Tennessee. I went to Windsor Elementary, Eastwood Elementary, Oakley Elementary, Lyon Jr. High, and Withrow until we moved. I still have my gold class ring with the Tiger on the side and the onyx stone! I was in ABK sorority, I still have my pin. Needless to say I was traumatized by the move! Anyway, I really want to attend the 40th Reunion. Is that ok? The Reunion is scheduled for my 58th birthday, how about that! I would so love to see the people I had to leave.